Fairly common and widespread throughout all coniferous forests. Feeds principally on seeds from cones of coniferous trees. 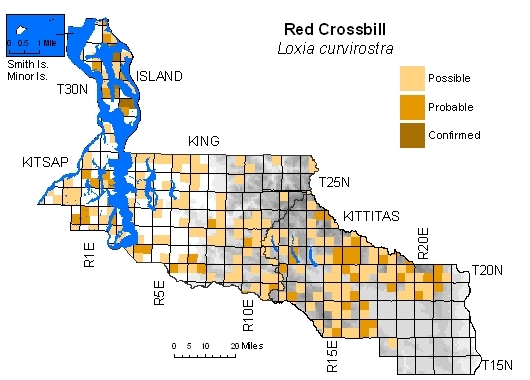 Distribution varies dependent on food availability, with birds absent from wide areas of appropriate habitat in years of poor mast production. 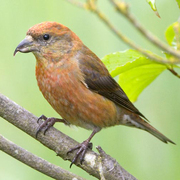 Several "types" of Red Crossbill—identifiable by call notes and feeding preferences for cones of different tree species—may eventually be recognized as separate species. At least four of these probably occur within our four-county area, but more study needed. Low level of breeding confirmation indicates that many records may represent transients in search of food sources.